We’d love your help. Let us know what’s wrong with this preview of Not Fit for Our Society by Peter Schrag. To ask other readers questions about Not Fit for Our Society, please sign up. Peter Schrag masterfully presents the issues of nativism and immigration in the United States. He thoroughly researches the subject matter and presents it in a provocative and entertaining way. The author is not afraid to criticize both sides of the aisle. Anyone with questions on the immigration debate should read this book. 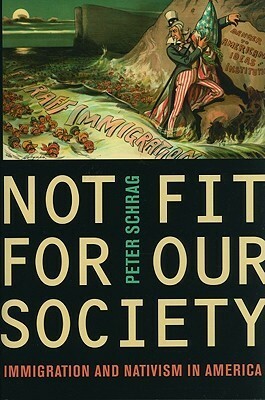 "The arguments of the past decade against immigration, legal, and illegal, virtually replay what was heard for more than a century; they're the same arguments that each gen Peter Schrag masterfully presents the issues of nativism and immigration in the United States. He thoroughly researches the subject matter and presents it in a provocative and entertaining way. The author is not afraid to criticize both sides of the aisle. Anyone with questions on the immigration debate should read this book. Schrag covers a touchy subject. He does an excellent job of describing how the arguments against immigration "reform" have hardly changed over the past 200 years. He includes an interesting discussion on America's eugenics programs of the 1920s and 1930s. Readers can be entertained in how eugencists and their supporters classified certain ethnic groups based on heavily biased tests; and how they needed to create the term "moron" as a classification between imbecile and feeble-minded person. Ente Schrag covers a touchy subject. He does an excellent job of describing how the arguments against immigration "reform" have hardly changed over the past 200 years. He includes an interesting discussion on America's eugenics programs of the 1920s and 1930s. Readers can be entertained in how eugencists and their supporters classified certain ethnic groups based on heavily biased tests; and how they needed to create the term "moron" as a classification between imbecile and feeble-minded person. Entertaining and unfortunate because so many felt (and continue to feel) this way. Most of the book relies on an excellent base of primary sources. Scholarly sources are referenced; but not as commonplace as one might expect in such a topic. The book takes a turn in the last two chapters and the conclusion. Each section becoming increasingly biased with a liberal slant. Readers probably expect this from UC Press; but most of the book is an excellent academic study. Chapter 6 is well-written; but there is a shift in the sources consulted with a noticeable slant towards relying more on news articles. The problem is not the news articles so much as the shift in writing away from a historical perspective, and towards a more informal style of reporting. Indeed, Shrag states in his introduction that the book is set up to refute arguments for current (2011) immigration reform, which is usually equated with restricting immigration. The shift becomes more pronounced in the 7th chapter which has devolved into a more liberal attack on conservative agenda. Readers may be receptive to this change because Schrag has refuted many conservative arguments throughout the book. However, relying on news articles to refute political agenda makes Schrag more into an entertainer like Jon Stewart or Bill Mahr rather than an academic. This book basically does two things: 1) it gives a descriptive overview of the various eras of anti-immigrant restrictionism throughout U.S. history, and 2) shows how the concerns, rhetoric, and themes of the restrictionists in each of these eras have remained largely constant, even as the target has changed (anti-French, anti-Chinese, anti-Irish, anti-Catholic, anti-Latino, etc.). The first few chapters and the last few chapters were the most interesting, while those in the middle tended to dra This book basically does two things: 1) it gives a descriptive overview of the various eras of anti-immigrant restrictionism throughout U.S. history, and 2) shows how the concerns, rhetoric, and themes of the restrictionists in each of these eras have remained largely constant, even as the target has changed (anti-French, anti-Chinese, anti-Irish, anti-Catholic, anti-Latino, etc.). The first few chapters and the last few chapters were the most interesting, while those in the middle tended to drag a bit. The author also includes a chapter with a recommendation for how to best approach immigration reform in the 21st century. This book is a history of immigration-related policies, prejudices and practices that we as a country have tried since the beginning of our statehood. It's a sad list of offensive policies. But, the author makes a good point that many of the concerns expressed today are repeats of old doomsday worries that never came to fruition. However, I do think that some important points were not addressed, but I don't have the space here to detail them. A really important read that compares anti-immigrant rhetoric today to that of 100 years ago, and shows that the "problems" we think we face now are not so different from then (so, presumably, the people who are complaining now about immigrants probably had grandparents who were complained about). It gets a little dicey at the end when he sort of incompletely compares the plight of Latino/a migrants to that of European migrants, but it's still, on the whole, an important book. A must-read book for anyone interested in the immigration debate in America. You can read my review in the California Journal of Politics and Policy.